Get spiffed up with the sophisticated scents of this genteel set. Got a big date? A whiskey tasting? A meeting of the Well-Groomed Gentlemen's Society? 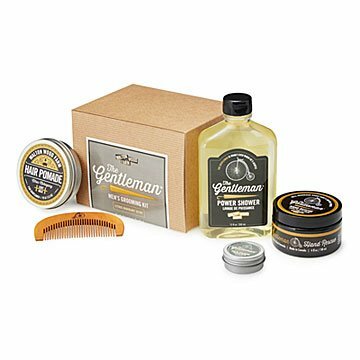 Get spiffed up with the classic clean and sophisticated scents of this grooming set. The Power Shower is a refreshing, efficient hair and body wash, while the solid cologne provides a finishing touch as crisp as an arrow collar. Both feature a portmanteau of masculine scents, with bright citrus anchored by woodsy mahogany and a touch of sweetness from sugar maple extract. The set also includes soothing citrus and musk hand "rescue" cream, citrus-mahogany pomade, and a solid hickory comb. Once you're clean, dry (like your martinis and your wit), and coifed, you'll be ready for any genteel endeavor. SLS, paraben, and dye-free. Made in the manly environs of Peterborough, Ontario, Canada.